(Newser) – In what Discover calls a "unique and touching paper" published in the journal Neurology Thursday, Robin Williams' widow shares the heartbreaking story of her husband's final 10 months and asks neurologists not to give up in their quest toward brain disease cures. Susan Schneider Williams refers to Lewy Body disease, the neurodegenerative disorder that ultimately led to Williams' suicide in August 2014, as "the terrorist inside my husband's brain." 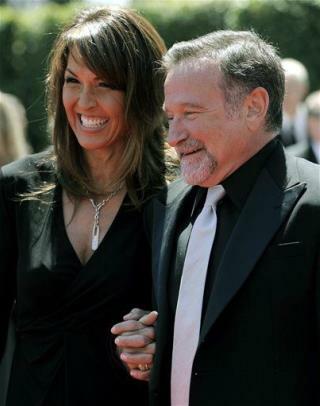 She describes how, toward the end of his life, "Robin was losing his mind and he was aware of it." He was struggling with paranoia, anxiety, delusions, insomnia, and other symptoms both physical and mental, and for months, he and his wife could get no answers about what was happening to him. How wonderful his wife shared the back story to what occurred. Hopefully it will lead to more awareness of this disease and more research for treatment and possibly a cure some day. Brave woman. Many humans in the USA die that way. The only reason he was given attention was to get the attention of those who watched his comedy, and advertise products towards those individuals who watched. This is the only reason humans get their name mentioned once, their toes point upwards permanently.